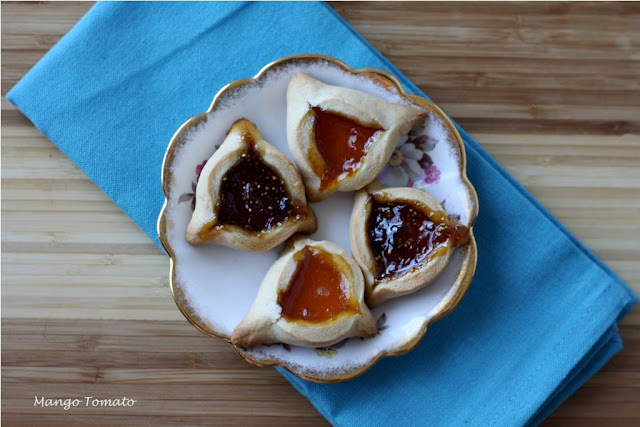 Mango & Tomato: What are Hamentashen? 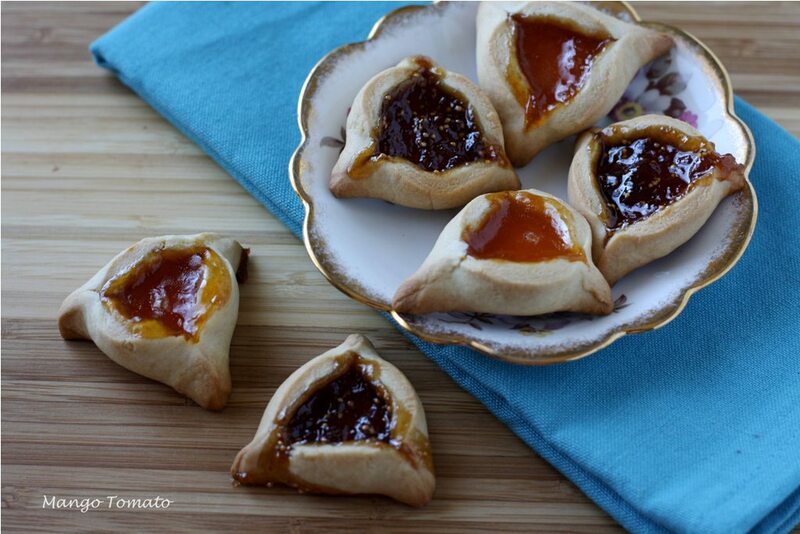 Purim cookies with fig and apricot jams. 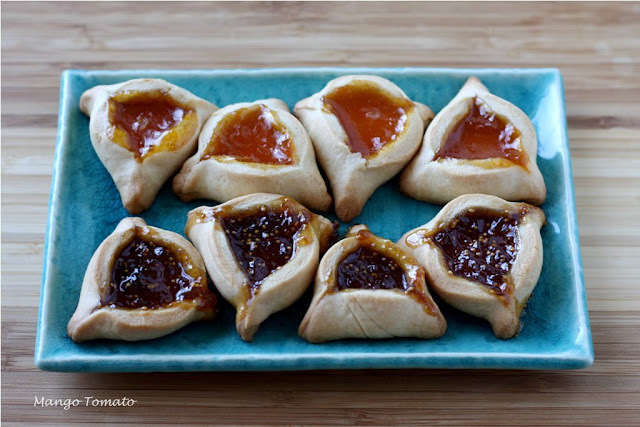 What are Hamentashen? 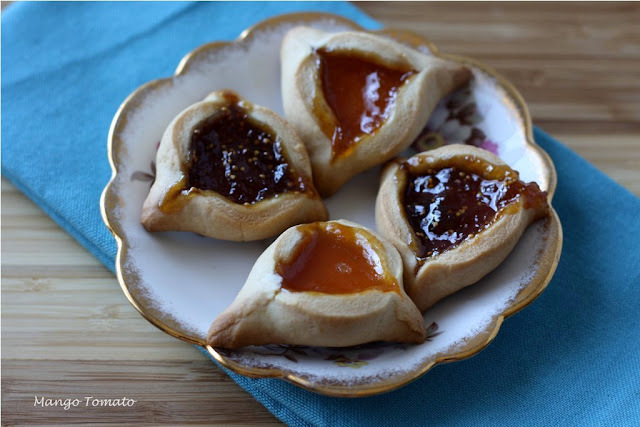 Purim cookies with fig and apricot jams. Tomorrow is Purim. What's Purim? It's a Jewish holiday celebrating the victory of Jewish people from Haman. Haman planned to kill all the Jews, but his plan was stopped by Mordechai and Queen Esther. You can find more information here, but being more of a cultural Jew, what I care most about when it comes to this holiday are hamentashen! What are hamentashen? They are triangular shaped cookies (because the evil Haman wore a triangular hat) filled with jams, poppy seed spread or chocolate. I've made them several times before with less than stellar results. This year I decided to try a recipe from Jewish Women International Magazine. This recipe used butter, flour, sugar, egg and a few extra ingredients. I followed the directions closely, but instead of molding the cookies by hand, rolled them out. The dough held together pretty well, and provided the best results by far compared to the other recipes I've used. But it still wasn't 100% fool proof. Maybe 100% fool proof recipes just don't exist? 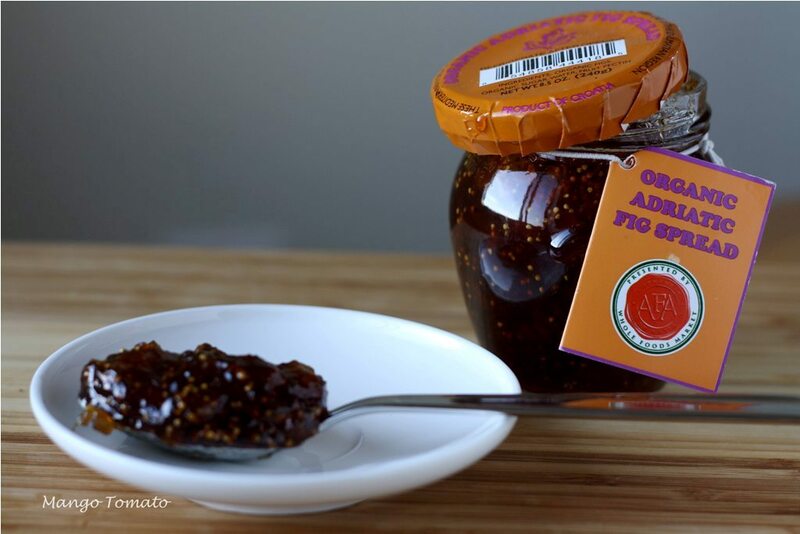 For the filling I used organic fig spread I received from Jenny of Gusto: Eating with Pleasure and also a store-bought apricot jam. I rolled the dough in between two sheets of wax paper and used a biscuit cutter to make the round shapes for the hamentashen. Make sure not to overfill these cookies! Just put approximately a teaspoon of the filling in the middle of each round. Then form the dough into a triangle shape. The recipe that I linked to in the beginning of the post has more directions, but it's really not that hard. 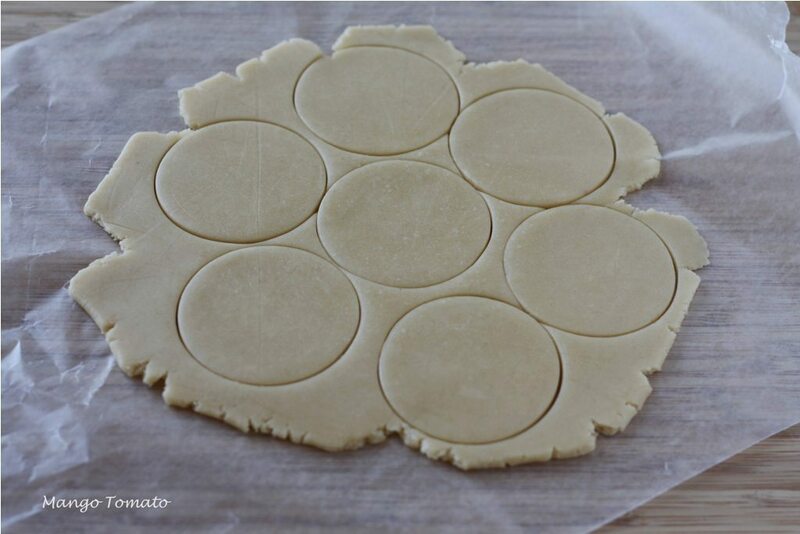 Just make sure to pinch the sides together so that they don't come apart while baking (some of mine did!). The saucer below is a gift from my friend Era: love it's delicate gold edges. A few of my friends who got to try these liked them. I was pretty pleased with them too. Will try to improve on the recipe or attempt a new one next year. 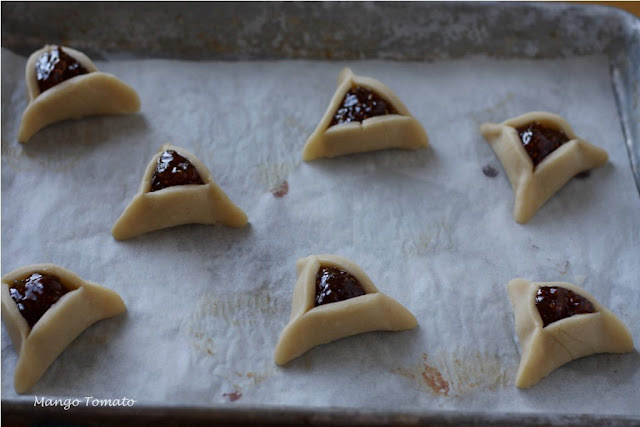 And now a question for you: What's YOUR favorite filling for the hamentashen? Ooh, fig spread sounds lovely. I've never seen a hamentash recipe that calls for butter. I'll have to bookmark that for next year's. Nutella, apple pie filling and raspberry jam are my favorites! mm, I love filled cookies, though I've never tried hamentashen. Raspberry is my favorite for thumbprint cookies! Thanks for the insight about hamentashen. I just learn something. They look so simple to make. Thanks for sharing! That looks so yummy. I think the only kind i've ever had had poppy seeds in them, it was a long time ago. I love the fig spread though, I think that would be my favorite. These look adorable like tiny triangular baskets. That fig filling sounds awesome! yummy...great job!! I love Hamantaschen...best part of Purim!!! My favorite filling is chocolate..preferably nutella. Those looks fantastic Olga... And as for my favorite filling; well could be anything really... Maybe something with fresh fruit or lemonfilling? 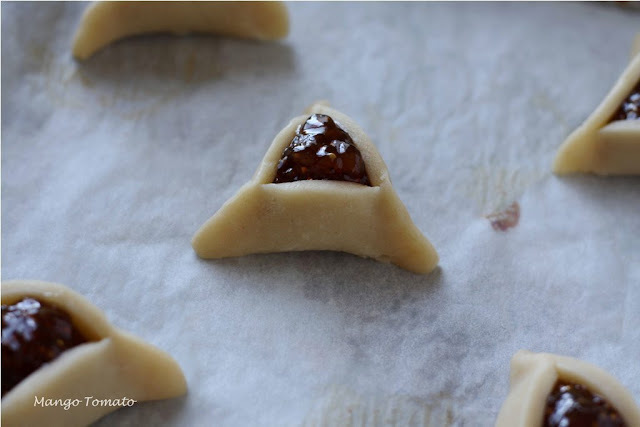 Fig hamentashen sound delightful on a beautiful day like today! My favorite filling is poppy-seed paste, though -- sweet and crunchy. Yum. I'm 27 years old and my very first batch of hamentaschen is about to go in the oven now! (My mother never made these when I was growing up, for some reason.) I'm a little nervous that I rolled the dough too thinly, and that they are all gong to burst open, but we'll see. I made some with nutella and some with strawberry jam, since I had both of those around, but fig sounds delicious! Olga, this is such a lovely presentation. Your hamentashen turned out beautifully. That fig spread sounds fantastic! Thanks for sharing all this info on hamentashen. It's new to me and I love learning bits of foodie and religious culture! 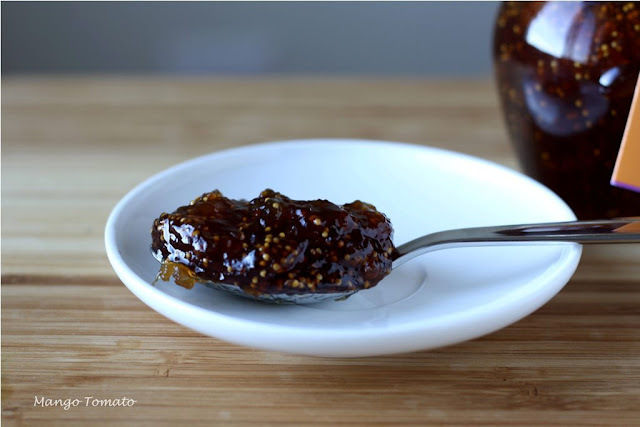 Love these...I am particularly smitten with fig jam now so these are particularly appealing to me! Natasha of Five Star Foodie had a recipe last year perhaps? You can see if her's was any different than the ones you found. They always sound like tasty cookies though, but anything with jam sounds good. Oooh, I think they look great. Once you find your perfect recipe, send me some cherry!! I absolutely love the poppyseed filling. I may have to try to make them next year. 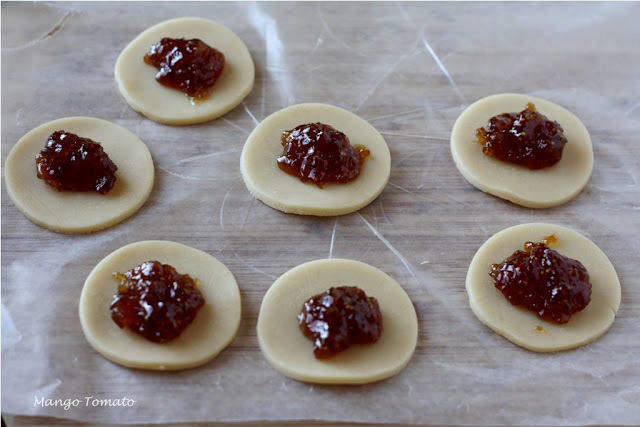 These look great, love the fig jam filling, gotta try that one for sure! Junior and I actually made hamentashen with whole wheat & egg whites, and lots of almond extract. I was a little scared that they'd fall apart but to our shock they actually turned out quite well. brownies in the middle is my favorite, but I'd never turn down raspberry either! I didn't make them this year. Yours look amazing! Saw them on photograzing! These look exotic and scrumptious!